Interested in one of the most challenging and intense inflatable obstacle courses around? The Adrenaline Rush Obstacle Course speaks for itself. 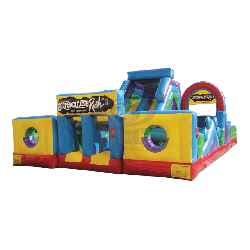 Get your heart racing and adrenaline rushing with 45' of inflatable fun. As soon as participants enter the starting point of the inflatable Adrenaline Rush obstacle course, they meet a small climbing wall, which foreshadows the final challenge. Successful passage through this section leads to a flurry of horizontal bars that individuals must maneuver through. After participants crawl through the corner turnaround, and are meet with multiple blowup obstacles, including upright inflatable tubes. This leads to a final challenge. A 15' climb up the rope ladder to get to the exit slide. This is where participants need adrenaline to help spur them forward and over the top of the slide.